McALLEN — Welcomed by a giant, yellow-and-black-striped caterpillar and a flurry of butterfly volunteers, many guests came here Saturday morning to Quinta Mazatlán with a pair of wings, too. Celebrating the northward migration of monarchs, children with butterflies painted on their cheeks cavorted at the third annual Monarch Fest, fluttering around the paths and grassy areas of the garden estate. Glittering wings of all colors were in sight, but orange was the most popular. Nine-year-old Ava Garcia, who had orange wings on her back and a butterfly in her hair bow, said that she adores butterflies but wishes there were more of them. In 2017, McAllen Mayor Jim Darling had the same thought. Along with 300 other mayors nationwide, Darling took initiative three years ago by signing the Mayors’ Monarch Pledge, promising to help restore butterfly habitat in their city. Under the pledge, mayors commit to implementing at least three of the 25 parts of the Mayors’ Monarch Pledge action items. McAllen is one of the four cities that has accomplished all actions, and was the second to be recognized by the federation as Monarch Champs. 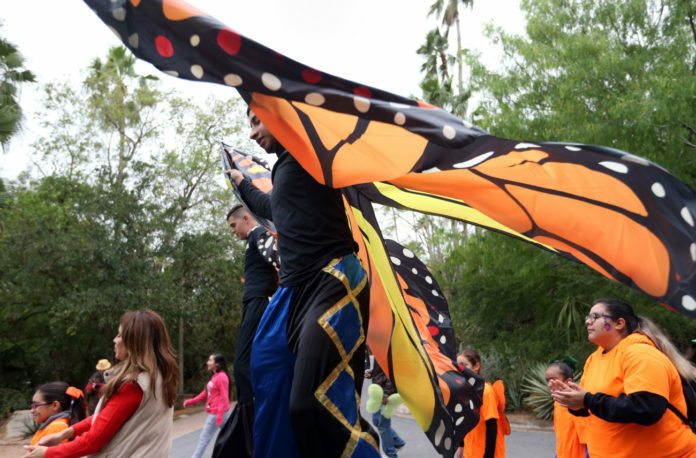 Though the event was in observance of monarchs journey north, Quinta Mazatlán Director Colleen Hook said it was also about bringing awareness about the sharp decline of the monarch population. According to the National Wildlife Federation, about 90 percent of monarchs have been lost in the past two decades due to widespread habitat loss, increased use of pesticides and climate change. Hook emphasized “miles of milkweed” because milkweed is an important plant for monarchs because it is the only host plant for caterpillars; these plants are the only species of plants that sustains immature butterflies. After four to five months of staying in the fir forests in Michoacan, Mexico, millions of monarchs start their 3,000-mile journey north to Canada starting in February, with the Rio Grande Valley part of the central flyway. As a part of the pledge, Hook said that for change to happen, education comes first. Zoologist Lucas Miller, also known as the Singing Zoologist, agreed with Hook, saying that teaching students about the importance of rescuing monarchs from endangerment is essential to recovery. Miller arrived here Friday evening from Austin for the event. Lining the courtyard were booths that featured homemade purses, jewelry and artwork by local crafters; while inside, attendees were able to learn more about plants that foster monarch-friendly environments, including milkweed. Visitors had the opportunity to buy plants for their own gardens at home. Speaking to students on the stage with him, Darling said that he takes his pledge seriously and will do what he can to make McAllen an inviting stop for monarchs.